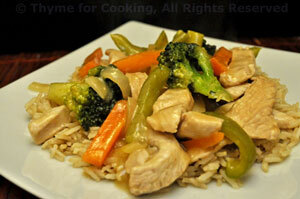 Turkey and Broccoli Stir Fry / Brown Rice, easy mid-week dinner. To round out our week of end-of-season fare, this is the last stir fry of this season. Julienne the pepper and carrots. Add onion, celery to skillet and stir-fry for 2 minutes. Add broccoli, carrots, pepper to skillet and stir-fry 5 minutes. Return turkey, onions, celery, garlic and ginger to pan. Add chicken stock, sherry and bring to a boil. Serve over rice, adding more soy sauce if desired, according to taste.